This is amazing story about the Veterans Health Administration appeared in the Wall Street Journal. It’s entirely dependent on the fact that the VHA is one of the only healthcare systems in the country which has spent the money to purchase the kind of lift equipment that keeps nursing personnel and patients safe. And clearly, as evoked here, having the right equipment encourages innovations in real caring. “A swimming pool in the ICU? You must be nuts.” The nurse’s voice was almost lost amid the whooshing ventilator and infusion pumps. Five days earlier, we had admitted Bennie, a Vietnam veteran, to the intensive care unit of our VA hospital in Nashville, Tenn. Frail and wrinkled, he had a look of utter confusion and a furrowed brow that would pluck the heartstrings of even the most calloused physician. Decades spent in Southern tobacco fields left him looking old enough to remember Hoover’s presidency. Double pneumonia and too much sedation made him delirious. As his attending physician, I was thankful for his family. His daughter and son, Laura and Len implored: “Take good care of Dad. He’s all we have.” Seeing him on a ventilator is terrifying, they said, but we believe in miracles. While loving, such a mind-set could become problematic since their father’s situation had the makings of a fatal illness despite our best technology. A senior physician protested that the patient was on a ventilator and said he’d never seen a bedside baptism like this in 50 years of practice. There was no shortage of opinions about whether this was appropriate, safe, or even possible. A large area next to Bennie’s bed was cleared and an electric pump inflated the pool. When a multiperson bucket brigade proved too difficult, an engineer rigged dialysis tubing to circulate the pool with a stream of warm water. Bennie was then hoisted high into the air via a patient-transfer lift, and the ventilator was unplugged before he was lowered into the pool. Len gently took his father, the man who’d shown him how to farm, into his arms. 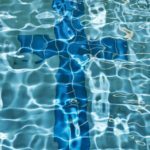 Following the cherished Christian tradition, he slowly submerged Bennie’s head completely under the water saying, “Dad, I baptize you in the name of God the Father, Son and Holy Spirit.” On cue, the palliative-care social worker began belting out “Amazing Grace.” The rest of us stood frozen in time. The ICU team’s bold yet careful response to Bennie’s unusual request taught me an enduring lesson regarding sympathy versus empathy. Sympathy is feeling sorry for someone; empathy is feeling “with” someone. In all the surrounding insanity of the hospital that day, diving deeply into Bennie’s life through his baptism on the breathing machine allowed all of us to be reborn, too. Being “with” him in that pool, and rising with him out of it, we walked into others’ lives better prepared to serve. Dr. Ely is a professor of medicine and critical care at the Nashville VA Medical Center and the Vanderbilt University Medical Center.